HICL Infrastructure Company Limited has announced that “it would be in the best interests of both the Company and its shareholders as a whole to change the domicile and tax residency of HICL’s investment business to the UK through the creation of a new UK incorporated company whose shares would be listed on the UKLA’s Official List and admitted to the main market of the London Stock Exchange to which all of the Company’s assets would be transferred” (Regulated News Service, 21 November 2018). The change is expected to be effective from 31 March 2019 or shortly after. A demand to terminate Barnet Council’s Capita Contracts and Redesign the Council has been made by Barnet UNISON. Barnet Council plans to carry out a review of three options – either to maintain the status quo, return some services in-house or to terminate both the back-office services and regeneration contracts and return to in-house provision. However, the Branch are convinced that Capita’s contract performance failures warrant immediate termination of both contracts which makes a review pointless. This should be accompanied by a redesign of the Council to integrate services and abolish commissioning; service planning with users and staff participation; social, economic, equality, environmental impact assessment and rebuilding the capability and capacity of the Council. Further Internal Audit evidence is provided of Capita’s continuing poor performance and its failure to fully implement the Adult Social Care IT system which now has to be replaced. See earlier report in 2018 on How the London Borough of Barnet was stopped from becoming the capital of outsourcing and privatisation. Published on 16th July 2018. Last updated 17th July 2018. An investigation into the ownership and offshoring of Scotland’s NPD and Hub Projects reveals that 60% of NPD (Non-Profit Distributing) and hub projects have shareholders with corporate relationships with offshore tax havens of Jersey, Guernsey, Cayman Islands, British Virgin Islands, Dubai International Financial Centre, Luxembourg and Cyprus. The investigation was commissioned by The Guardian and by The Ferret investigative journalism platform, both of which have published detailed analysis of the findings. Public sector pension funds are heavily involved, for example, Strathclyde Pension Fund has £80m investment in Equitix (Tetragon Financial Group Limited, Guernsey). In addition to the report, a spreadsheet summary of NPD and Hub equity ownership a summary of Tetragon:Equitix Company ownership as revealed in company annual reports, and a spreadsheet of NPD and Hubco Auditors and lawyers is also available. The paper by Dr Helen Mercer and Professor Dexter Whitfield is available via the Public Services International Research Unit, University of Greenwich. 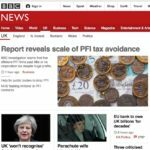 The article’s principal purpose is to provide an initial set of costings relating to the proposal to end PFIs in the UK through nationalising the Special Purpose Vehicles. The article uses book value to estimate that the cost of compensating the shareholders of the SPVs on HM Treasury database would be between £2.3bn and £2.5bn. It further analyse the potential savings to public authorities. The article proposes that service contracts are renegotiated so that the public authorities contract directly with the providers, not via the SPV. This secures significant annual savings from the elimination of operating profits, of £1.4bn, indicating that nationalisation will pay for itself within two years. Further the article proposes to honour all outstanding liabilities but to secure substantial refinancing through a new body in which ownership of the SPVs will be vested. Finally the article suggests that as service contracts are ended, either through break clauses or other reasons, the public authorities must bring provision ‘in-house’, ending outsourcing and also providing further savings from more rational and integrated provision. The approach has been developed on the basis of significant research into how PFIs operate and consideration of the range of alternative solutions to the PFI problem that have been put forward so far. These issues are also explained and developed in the article. The second edition, October 2018, includes an appendix with critical comments on a CHPI paper. Published on 8th May 2018. Last updated 8th November 2018. The John Laing Infrastructure Fund (JLIF) has decided to terminate its Guernsey offshore registration and become a UK investment trust. Announcing the results and annual report for 2017 on 23 March 2018, the chair, David MacLellan, cited recent problems in JLIF PFI projects such as the serious defects at Roseberry Park Hospital, fire safety enforcement notices at Peterborough Hospital and fire safety issues at Camden Social Housing following the devastating Grenfell Tower fire in London. He also referred to the liquidation of construction company Carillion plc; and the impact of tax changes under the OECD’a Base Erosion and Profit Shifting (BEPS) initiative. The risk of nationalisation and/or a shift in public policy away from the PPP model were given a triple red risk rating by the JLIF Risk Committee. JLIF has 52 UK Private Finance Initiative projects with an average 67.5% equity stake including 23 projects with 100% equity ownership (February 2018). However, a few months later a consortium of funds led by Dalmore Capital Limited funds managed by Equitix Investment Management Limited (Tetragon Financial Group Limited, Guernsey) made a £1,448m cash offer for JLIF which was accepted by shareholders. Since the Bid Company was based in Guernsey its is expected the renamed JLIF will remain offshore in Guernsey. Published on 30th March 2018. Last updated 13th October 2018.